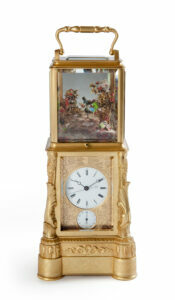 The day-going, spring-driven brass movement of this strut clock has a going train only. It has lever escapement with hairspring balance and regulation. 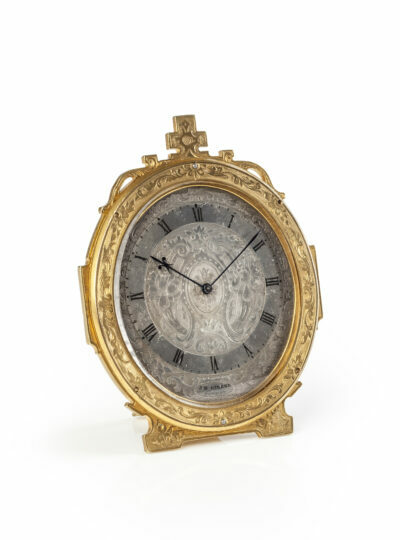 The engraved oval silvered-brass dial has a Roman chapter ring with five-minute and minute divisions. The time is indicated by a pair of blued-steel hands, the hour hand with a fleur-de-lys motif. The elaborate engraving depicts floral, leaf and scroll motifs. The dial is protected by an oval, facetted glass in an engraved gilt-brass bezel. The dial is signed in an engraved cartouche J.B. Girerd LONDON. 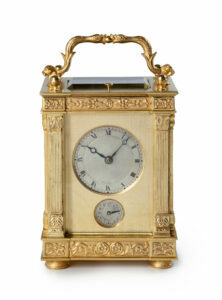 The engraved oval firegilt brass case of this strut clock has a pierced moulding at the top, surmounted by a cross. The clock is wound from the back, where the time can also be set. To avoid confusion the word ‘hands’ is engraved next to the hole. 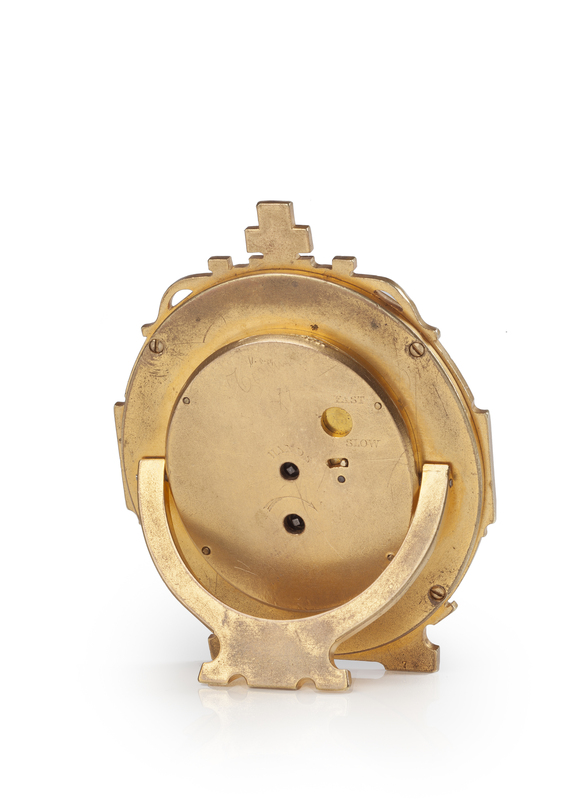 To the right of this hole is an aperture with a shutter which gives access to the regulator arm, the function and the direction of which are indicated by the words ‘slow/fast’ The clock can be positioned with an easel-type of support at the back: the strut. The case is stamped on the inside with the maker’s name: T. Cole. Depth 3 cm, strut included. – J.B. Hawkins, Thomas Cole & Victorian Clockmaking, Sydney, 1975, p. 12 ff. – B. Loomes, Watchmakers & Clockmakers of the World, London, 2006, p. 164. Thomas Cole was born in Nether Stowey, Somerset, in 1800. He was baptised here on 17 March of the same year. His father, James Cole, was probably also a clockmaker and was married to Catherine Slocombe. Thomas had an older brother, James Ferguson Cole, who was to become a famous clockmaker and an older sister Elizabeth. In 1813 the family left Nether Stowey for an unknown destination. 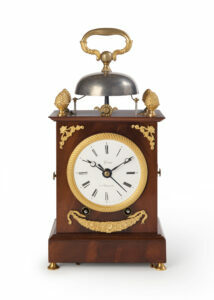 James Ferguson established himself as a clockmaker in London in 1821, followed by Thomas two years later. From 1829 the brothers worked together in New Bond Street. After a few years they split up again and Thomas Cole only resurfaces in the records in 1838 as a clockmaker at 10 Upper King Street Bloomsbury London. After Thomas’s first wife died, he remarried, this time to Charlotte Boulding on 28 October 1841. Charlotte was then 21 years of age. Their first child Thomas William was born on 13 August 1842. Later another son and two daughters followed. From 1851 or 1852 Thomas Cole set up his last workshop at 6 Castle Street Holborn. He was selected to become a member of the Royal Society of Arts on 28 June 1861 but seemed to have declined the offer. He became a member of the British Horological Institute where his brother held an important position. Thomas Cole died on 3 January 1864.